How are you affected in the event the rentâ€™s on time. Tip #51: Money in the Bank? Every lease provides a due date, and most allow for added fees if the rent check is late. But what happens when the rent’s on time, and you delay depositing the check? Maybe you are out of town, or perhaps you like to do all your accounting at once, at the end of the rent cycle. Regardless of your reasons, it’s a common complaint of tenants – they break their neck getting you the rent on time to avoid a late fee, and you dillydally getting the check to the bank. If you don’t deposit your tenant’s check right away, they may conclude that you don’t need the money – certainly not on time, and you may find they no longer take your due date seriously. You also increase the chance the check will bounce. Many tenants admit that they write checks off their running balance. They assume the rent’s been deducted. As a result, they may have spent the rent money before they catch their mistake. In addition, late fees have to be related to actual losses you may suffer, for instance a penalty for not paying your mortgage on time. 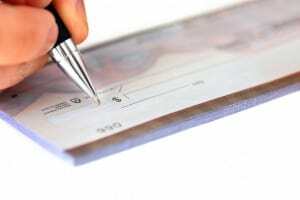 If you routinely delay depositing rent checks, you may have a tough time convincing a judge you were damaged when a tenant pays late. Yes, you have every legal right to deposit rent checks whenever you please – you can wait up to six months, in fact. But if you do delay, you may be sending the wrong message to your tenant. After all, putting money in the bank is the reason you became a landlord in the first place!